Perioperative management of pregnant patients, who require a neurosurgical intervention, poses several unique challenges for the neuroanesthetist. Besides the standard neuroanesthesia concerns, the delicate feto-maternal homeostasis has to be maintained, in order to achieve a good maternal outcome without compromising fetal safety. This may necessitate several modifications in the conventional neuroanesthesia technique and, often, a need to skillfully balance, competing or even contradictory clinical goals. Other pertinent dilemma that arises during management includes decisions regarding the optimal timing of neurosurgery, continuation or termination of pregnancy, optimal timing and mode of delivery, and possibility of a combined cesarean section and neurosurgery in patients with near-term pregnancy. Moreover, there are no well-established recommendations that can help to guide the management of these patients. Optimal perioperative management in these circumstances mandates an integrated understanding not only of neurosurgical anesthesia but also of the maternal physiological changes during pregnancy and their implications on feto-maternal homeostasis, intracranial pathology, and the neuroanesthesia technique, along with the pertinent perioperative fetal concerns and the effect of anesthetic drugs on feto-maternal physiology and cerebral homeostasis; importantly, a well-planned, individualized, and multidisciplinary approach is vital for a favorable outcome. 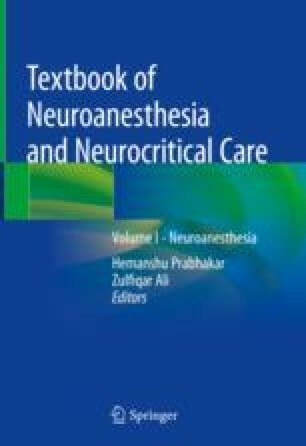 The initial sections of this chapter provide an overview of the basic fundamentals; the latter sections describe the principles of anesthetic management for pregnant patients during a cranial surgery, a combined cesarean section and neurosurgery, spinal surgery, neuroendovascular procedure, and traumatic brain/spinal cord injury. Cluver C, Novikova N, Hofmeyr GJ, Hall DR. Maternal position during caesarean section for preventing maternal and neonatal complications. Cochrane Database Syst Rev. 2013;(3):CD007623. https://doi.org/10.1002/14651858.CD007623.pub3.